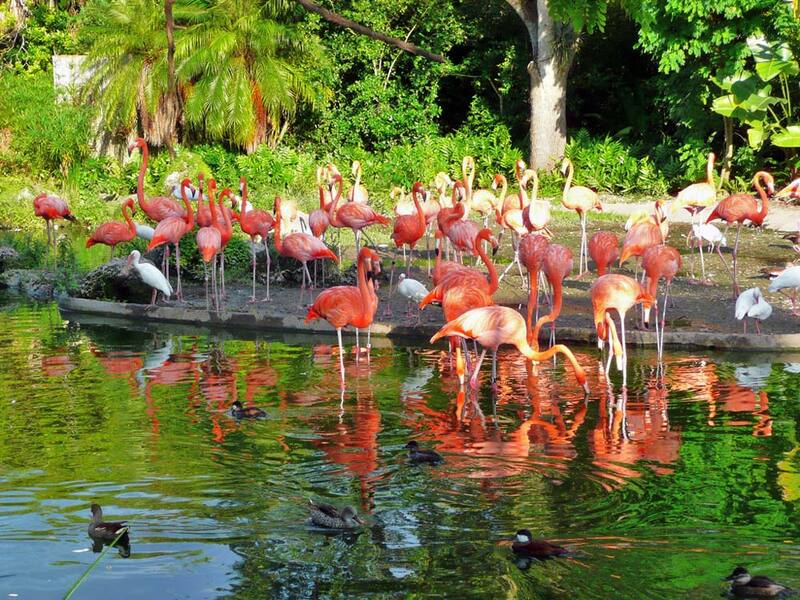 Zoo Miami is also known as the Miami-Dade County Zoological Park and Gardens and it used to be called the Miami MetroZoo. It is the oldest and biggest zoological garden that is in Florida. In fact, it is America’s only tropical zoo. This zoo is home to more than two thousand animals that live on more than seven hundred acres. About seven hundred of the wild animals are not caged. There are over one thousand plants that are visible from the walkways. The zoo property also includes Lake Iguana. Guests can take the monorail that is air-conditioned and ride over the zoo’s grounds. It offers a wonderful aerial look at the zoo and it is also a very convenient way for visitors to move between the different sections. There are four monorail stations and the first one stops between the Asia section and the Australia section, while the second one is in the Asia section. The last two are located in the Africa section. Guided tours and narrated tram rides are offered every day. The zoo was first developed in 1948, when one goat, two black bears and three monkeys were bought. These animals started the Crandon Park Zoo. The zoo was about forty-eight acres. A hurricane destroyed the zoo in 1965 and over two hundred animals died. In 1975, construction started on the Miami MetroZoo and it opened in 1980. Zoo Miami has four major sections: Africa, Asia, Australia, as well as Amazon and Beyond. Pelican Cove is an area that has a very large pond that features a beautiful waterfall. It contains not only pelicans, but other kinds of waterfowl as well. Also, there is Dr. Wilde’s World attraction and it is a seasonal, indoor interactive animal exhibition. This area of the zoo features many different animals from various locations in Africa. Visitors get a close look at the animals and they can even feed some giraffes for a small charge. The Africa section is divided into two parts. The biggest area is situated in the southern section of the zoo. The others are located between the Australia and Asia exhibits. Since the new zoo was built one of its star attractions has been the popular white Bengal tiger exhibition which is located in this section. The zoo’s Asian section features a wide selection of animals. The interesting Asian River Life Experience is multi-leveled and it looks just like an Asian river brook. Visitors have the opportunity to get right next to and even brush one of the large Indian rhinoceros that are in Kaziranga Camp’s Rhino Encounter. The Wings of Asia can also be found in this section. This aviary features over three hundred rare birds from seventy different species. They live in a mixed forest area that has a temperate climate. The exhibit highlights the bird’s evolutionary link with dinosaurs. It is one of the largest aviaries in the world. The aviary is more than fifty thousand square feet in size. This area also has a children’s petting zoo. It is home to many unique animals such as the meerkat. In addition, there is a toadstool exhibit that features amphibians, small reptiles, and insects. There are beautiful butterfly gardens in this section, along with a fun carousel that features various animal species. Visitors can also take a ride on a camel in this area. This area of the zoo showcases various specimens from the Oceania region. Visitors can see kangaroos, koalas and a giant tortoise. Right next to this area is the versatile Sami Amphitheater and it offers different animal shows, cultural events and concerts. This amphitheater can seat more than eight hundred guests and it has show nearly every day. This is the newest exhibit at Zoo Miami and it opened in 2008. This section has about twenty-seven acres and it features all kinds of flora and fauna from tropical America. It has four unique areas which are the Cloud Forest, Village Plaza, Atlantic Forest-Pantanal and Amazonia. The Village Plaza gives guests an understanding of the different civilizations in Central America, as well as South America. The other areas display indigenous habitats which can be seen in the Amazon region. Mission Everglades is expected to open in 2014. It will feature various native Florida ecosystems such as the pine rocklands, different coastal habitats and the Everglades. It will also feature many Florida species including wood storks, pelicans, herons, bald eagles, flamingos, alligators, black bears and the Florida panther. Additionally, there will be an exhibit that will have some of Florida’s venomous snakes on display.